Learn How to Start a Ban the Box Campaign! NELP’s Awesome Opportunity to Learn How to Ban the Box in Your County and State! Register for NELP’s webinar to learn how to launch a Fair Chance campaign! To introduce the Fair Chance – Ban the Box toolkit, NELP is hosting a webinar for advocates and policymakers. Using examples from recent campaigns, NELP staff will walk through the toolkit’s new model policies, media and research resources, and more to support your own local fair chance campaign. This webinar is an opportunity for seasoned advocates and policymakers as well as new organizers to learn best practices, strategize responses to common opposition, and be introduced to ready-to-use materials. Date: Tuesday, May 13th Time: 10-11am Pacific / 1-2pm Eastern Who: NELP staff Eleven states and over 60 cities and counties have it. Does yours? Bring a Fair Chance to your community. Register for the free webinar here. Imagine wearing an orange prison jumpsuit walking around town for forty days straight. In Texas. Kent McKeever, a lawyer at Mission Waco Legal Services, decided to do exactly that for Lent. For those of us who have not gone through the process of reentry, we can never know what it is like to have social stigma and rejection attached to yourself and your name when facing a society reluctant to help you out. But Mr. McKeever’s social experiment at least brings to light the stigma placed upon those released from prison and on parole. Mr. McKeever wore the jumpsuit when spending time with his daughter, grocery shopping, and even at work, garnishing stares, questioning glances, and avoidance from those passing by him. He felt dehumanized wearing the jumpsuit – even though it was his own choice, he felt that his individuality had been taken away from him. During a vacation he took, he found himself full of social anxiety when he went out to eat and see a movie with his daughter. On his blog, he described asking himself, “Will they accept who I am in spite of my ‘uniform’? Are they afraid of me?” His anxiety about how he would be received by the world were common thoughts throughout every day. Although formerly incarcerated people in the community no longer don orange jumpsuits, they carry the “orange jumpsuit” stigma with them wherever they go. Their names and records carry the weight of past wrongdoings, no matter how they have changed since their committed offense, and how different they are today from the people they were years ago. As we have discussed on the blog here and here, having a criminal record is particularly challenging—and carries huge stigmas—when a person tries to get a job. People are forced to “check the box” on initial applications, the scarlet letter that then prevents them from getting their foot in the door. Because of his experience, Mr. McKeever is working to urge employers around the country to stop asking about applicants’ criminal histories before they have a chance to interview with the company. A study cited by the National Institute of Justice shows that while employers are reluctant to hire those with criminal records, employment prospects improve when applicants actually interact face-to-face with the employer. That is because, beyond the stigma, beyond the orange jumpsuit, there is just a person, like the rest of us, with strengths and weaknesses, skills and passions, who wants the chance to tell their story. Mr. McKeever’s 40 day experiment, we hope, will push more people, especially employers, to look past the orange veil of a criminal record and focus on who the individual is now –their morals, values, and if they have redeemed themselves. Those in the reentry process who want to work will show determination to do so; employers just have to reach out a hand. 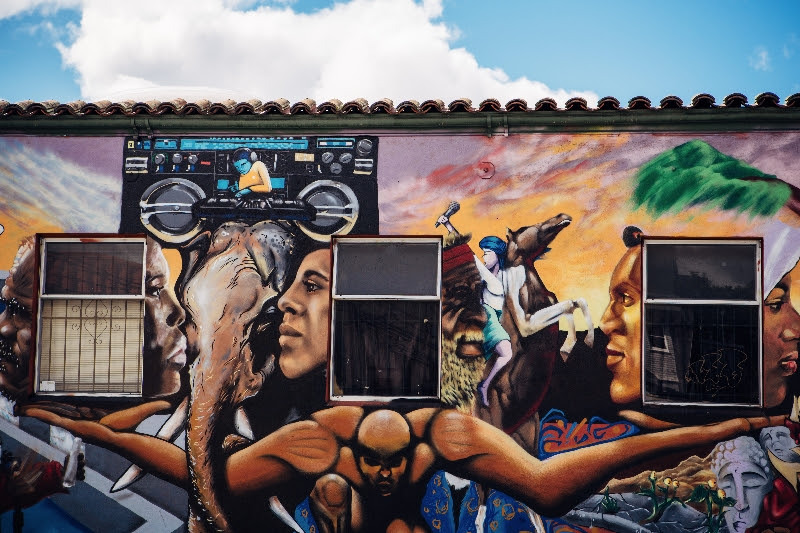 Bay Area Reentry Connection Event – Continuing the Reentry Conversation! Our incredible speakers & venue. 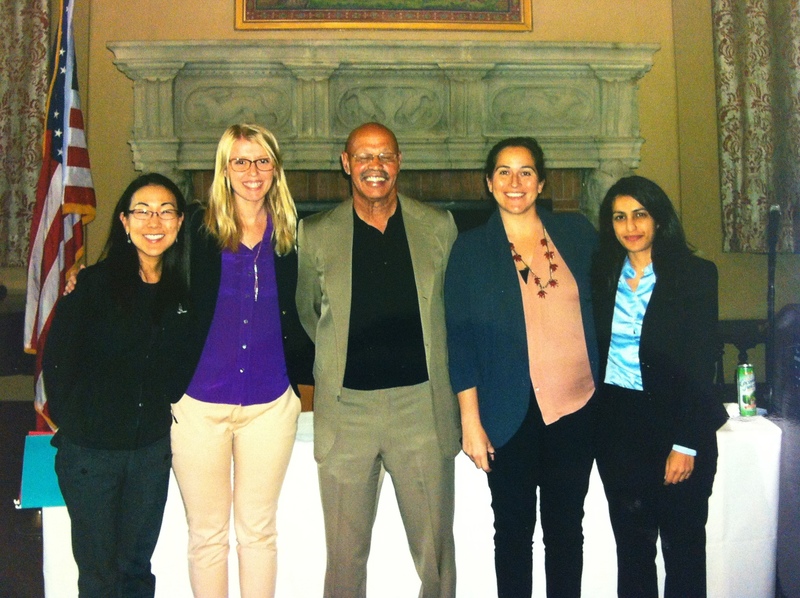 Root & Rebound Staff (from left to right) Kony Kim, Sonja Tonnesen, Katherine Katcher, and Aiasha Khalid with CRI Reentry Coordinator, Alton Mcsween or “Coach” (center). 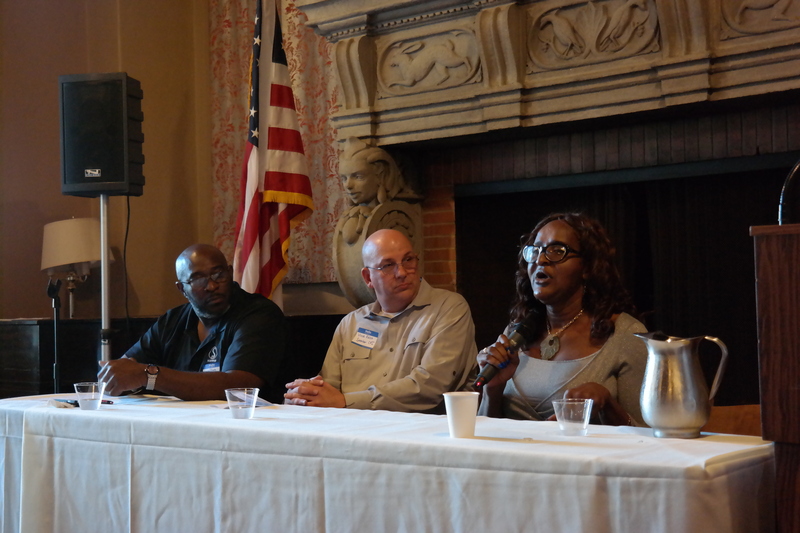 Last week, Root & Rebound and the California Reentry Institute were delighted to co-host the Bay Area Reentry Connection event at the Berkeley City Club. The event brought together many inspirational groups and individuals to discuss the complex issues and challenges surrounding reentry. The turnout was huge—demonstrating the passion and dedication of all those working in criminal justice and reentry issues around the Bay Area. More than 100 people were in attendance! In the first part of the evening, the audience heard four powerful speakers, all formerly incarcerated individuals, who shared their personal stories of incarceration and reentry, and the many challenges and barriers they faced and continue to face as people with criminal records. 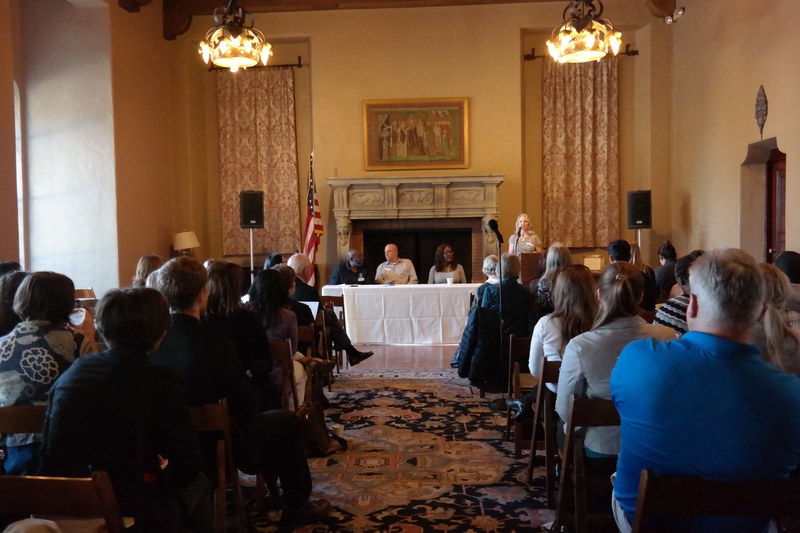 The speakers described life in reentry, especially the early days, as stressful, thrilling and terrifying. They described how decades of incarceration can fill a person with trauma and fear, and how hard it can be to adapt the chaotic and changed world they return to. Simple things such as using a phone, travelling to an appointment, and using public transport can take hours of planning and can cause severe anxiety. For many of the speakers, the biggest help of all was their social network—or just one person—who made the difference: a friend, a wife, social worker who gave them the time of day, who really listened, and who used their own social capital to build support for the speaker. A key theme that came out of the speaker panel and the Q&A with them was the need for reentry organizations to improve collaboration so that people in reentry receive a continuum of care and stronger wraparound services. Since we as a legal advocacy center are committed to increasing collaboration in the field so that clients receive more holistic care, we were thrilled that this was a main takeaway from the event. We hope to host many more collaborative events and workshops in future and we would love to hear from any of our readers who would like to be involved in any future planning. 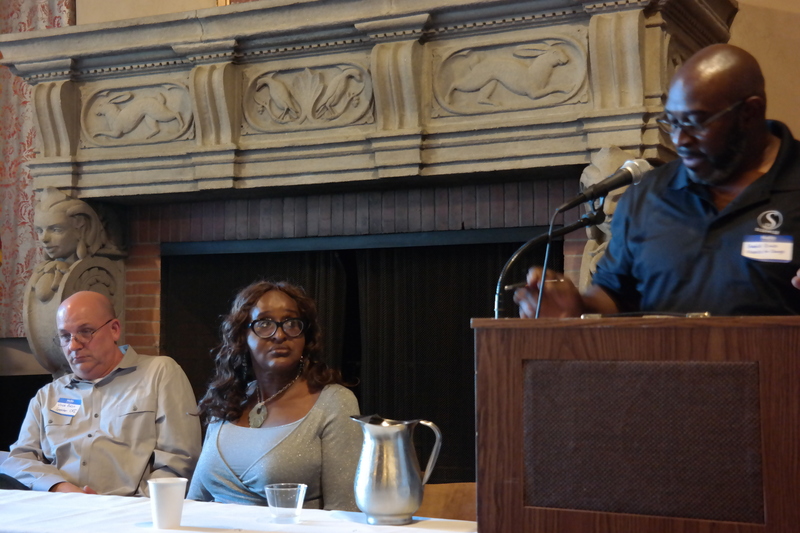 We would like to thank the Berkeley City Club as well as all those who attended the event, for your enthusiasm and passion about reentry issues! Our team has an exciting update – we are officially launching our website today! It is a monumental step for our organization as we continue to grow and expand our reentry advocacy work across the Bay Area, throughout California, and beyond. Please click here to view the site and visit often: WWW.ROOTANDREBOUND.ORG. Some highlights of our site include pages on our mission & vision and story, our four key programs, and our reentry resource center, where we share reentry legal information and broader reentry resources. We are so excited to finally launch our permanent presence on the web! We want to thank our incredibly talented photographer, Lucille Lawrence at Lucille Lawrence photography, and our website designer, Missy Austin at Missy Austin Graphic Design, for showcasing the work of Root & Rebound so beautifully. They both donated their time and talent to further our work. Please share our site with friends, colleagues and family, and all those who are interested in reentry services across California and nationally. This website is an important step forward in communicating with our online community and reaching our fundraising goal of $100,000 from individual donors in 2014. What’s the difference between Parole & Probation? Probation: Probation is a type of original sentence handed down by a judge at trial, often instead of incarceration. Probation in California (CA Penal Code Section 1203) reduces or eliminates the time that a person must spend in custody. It allows a person convicted of a crime to remain in a community setting under supervision—under certain conditions. Their movements and activities may be highly restricted but they are allowed to remain in their communities, to contribute to society, and to vote in local and national elections. Depending on the circumstances, the court or probation officer monitors the person’s compliance with his/her probation terms. There is a good summary of California probation online here. Parole: In California, parole is a condition of release for a person coming out of prison. California parole only applies in felony cases where a person is sent to California state prison and it only takes effect after their release. Unlike probation, which might be part of an initial sentence, parole allows individuals early release from their prison sentences. While probation is a sentence handed down by a judge, parole may be granted by a parole board after a person has served time. The conditions of parole are usually similar to the conditions of probation. An individual on parole, however, is denied their right to vote for the entire time they remain on parole. The standard conditions of parole are listed on the California Department of Corrections and Rehabilitation’s website here. People who are sentenced to state prison for potential life sentences (for example, 25 years to life) are only eligible for parole after they serve the determinate part of their sentence, after the parole board determines that they are ready to re-enter society. That determination takes place during a California Board of Parole Hearings suitability (“Lifer”) hearing. There is a good summary of California parole online here. Realignment and Community Supervision: In 2011, the U.S. Supreme Court declared overcrowding in California’s prisons to be cruel and unusual punishment. The court demanded that California cut its prison population, and the state responded by passing the Public Safety Realignment Act. Under the new law, people released from a state prison after incarceration for non-violent, non-serious, non-sexual crimes are placed under supervision by local, county probation officers. This third form of supervision is called Post-Release Community Supervision (PRCS). In short, Realignment allows counties to decide how best to supervise and serve the needs of individuals exiting jails and prisons. A national news story about Los Angeles County’s approach can be found here. San Francisco County’s implementation plan can be found here. It is also important to note that under the new law, if a person on community supervision violates the terms of his or her release, that person won’t return to state prison. Instead, local agencies will take on those cases as well. Federal Probation and Parole: People convicted of certain federal offenses may be sentenced to federal probation or supervised released. As the community corrections arm of the federal judiciary and an agency of the U.S. District Courts, The U.S. 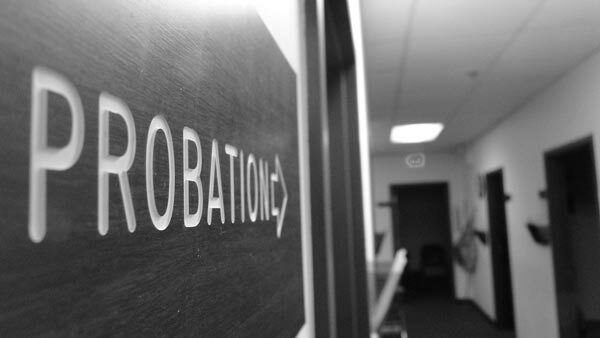 Probation and Pretrial Services System oversees federal probation. A much smaller group of people—namely those sentenced prior to November 1, 1987, those who violated laws of the District of Columbia, those convicted of crimes within the military criminal justice system, and people convicted in certain foreign transfer treaty cases—may still be on federal parole, which the Sentencing Act of 1984 otherwise eliminated. To learn more about how federal probation differs from state and local community corrections and supervision, please visit the U.S. Courts website. Understanding what life—including one’s legal rights or restrictions—can look like for returning citizens is the first step in finding creative and holistic ways to reduce barriers and maximize opportunities for people’s success in the community as they return home. We at Root & Rebound are passionate about sharing our knowledge and resources on reentry as well as collaborating with all the great agencies and non-profits in the Bay Area to support & stand alongside returning citizens. Veterans Bill moving through California Legislature – Rehabilitation Over Incarceration! Today we want to update you on an important new development in Californian legislation related to sentencing of veterans. This legislation reflects a growing awareness about the links between mental illness, crime, and incarceration. 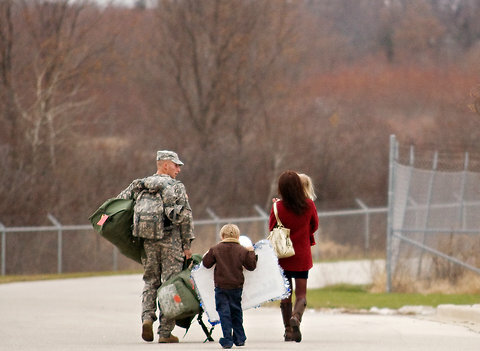 On Veterans Day we wrote about the fact that people who have fought for their country often come home with PTSD and mental health issues, but little to no support or services. Many end up homeless and then in the criminal justice system. The numbers are staggering: there are approximately 700,000 veterans in US prisons and jails; since 2004, the number of veterans treated for mental illness and substance abuse has increased 38 percent; unemployment for male and female veterans is consistently higher than for non-veterans, at 9.6% and 8.8% respectively and nearly 58,000 veterans are estimated to be homeless on any given night. Change cannot come soon enough. A new bill recently passed in the California Assembly, AB2098, which is headed for the Senate, aims to change the current state of affairs for veterans. It urges judges to grant probation and give shorter prison terms to veterans charged with crimes who have mental health issues as a result of their years of active service. This bill is significant because it recognizes the complex needs and challenges facing our veterans – that all too often, they return home with emotional and physical scars that are left unaddressed. Research has shown that PTSD is prevalent among veterans: one in five returning veterans from Iraq and Afghanistan suffer from the condition. The author of the bill, Democrat Marc Levine of San Rafael cited as a basis for this bill evidence linking Post Traumatic Stress Disorder (PTSD) and the likelihood of a criminal record among veterans of Iraq and Afghanistan. California law already requires judges to take into account a defendant’s military service and assess to what extent PTSD or any other conditions or illnesses could be a factor in the crime. This bill goes much further. It would require judges to impose shorter sentences for veterans who qualify, or grant probation under which veterans would be required and able to seek treatment for their condition. The bill is now headed to the California Senate. To find out more about the AB2098 bill and how you can support it, please check here. To support the bill, call your State Senator! To find your State Senate representative, you can search here. To read more on the topic, see this article. Treatment Advocacy Center, The Treatment of Persons with Mental Illness in Prisons and Jails, 2014. See an executive summary here and the full report here. New York City’s mayor Bill de Blasio is bringing in a nationally acclaimed prison reformer, Joseph Ponte, as New York’s newly appointed Commissioner of the NYC Department of Correction. Mr. Ponte has worked in corrections for 40 years, most recently as Commissioner of the Maine Department of Corrections, where he reduced solitary confinement by two-thirds and eliminated disciplinary segregation for people identified as mentally ill. His appointment marks a major sea change in New York City corrections policy, as the NYC Department of Corrections seeks to end the overuse of solitary confinement, curtail officers’ use of excessive force, and improve resources to handle the needs of incarcerated people living with mental illness. If successful, this will lead to healthier people inside prisons and jails and healthier people returning to the community. 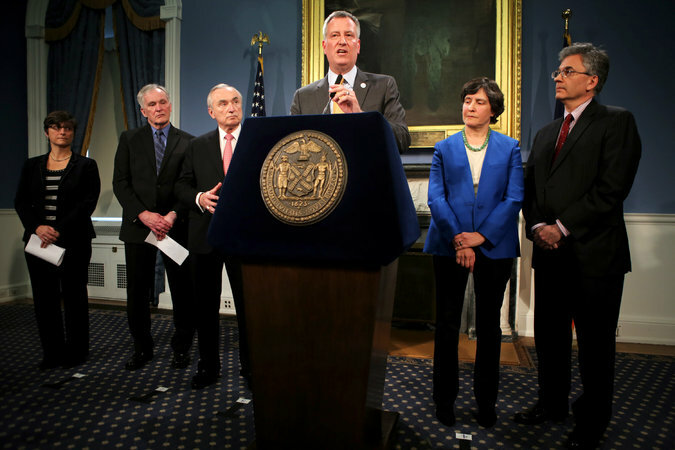 Root & Rebound is thrilled to see the nation’s largest city bring a major reformer into the world of corrections. In past blog posts, we have written about awful prison practices like solitary confinement, which only serve to break people down and exacerbate mental illness. Dignity & respect, as Mr. Ponte so eloquently said, underly the need to reform and eliminate such practices. Treating people currently and formerly incarcerated with dignity & respect will lead to healthier, happier, more productive people both inside and outside of prisons and jails. Root & Rebound applauds you, NYC! Read more about this story in the N.Y. Times & from the NYC Office of the Mayor. Support SB 1384! Help people access stable jobs as certified nursing assistants. We urge you to support Senate Bill 1384! SB 1384 (Mitchell) reforms the stringent conviction barriers to becoming a certified nursing assistant (CNA) by eliminating the automatic denial of certified nursing assistant (CNA) applicants that have one of a long list of specific convictions, regardless of how much time has passed or a person’s significant efforts to transform. It provides all CNA applicants discretionary review of their criminal record and recognizes that certain conditions–like the passage of time and no subsequent convictions–is actual evidence of rehabilitation. SB 1384 expands opportunities for qualified, rehabilitated individuals to access this growing industry of living-wage jobs. In Root & Rebound’s conversations with formerly incarcerated people and service providers, this is a barrier that we have heard time and time again. Certified nursing assistants make a living wage and it is a good, stable job that should be open to people who have shown their rehabilitation and commitment to working. Mandatory rejection of prospective CNAs—even for decades-old convictions and low-level offenses like petty theft—disregards studies showing that the passage of time substantially reduces the likelihood of recidivism to a level equal to those who have never been arrested. Such blanket prohibitions against employment opportunities defy California’s commitment to evidence-based policies that reduce recidivism and encourage reintegration. Studies show that stable employment decreases the likelihood of recidivism by as much as 62%. Yet, California continues to impose stringent barriers on the hundreds of licensed occupations that would provide stability and increased mobility for persons who most need it. SB 1384 protects public safety by preserving the discretion to deny a CNA application where there is evidence that the individual has not rehabilitated. This commonsense revision models the current provisions that apply to Registered Nurses and thus gives CNA applicants with a criminal record a chance to be evaluated on the basis of their record and all evidence of rehabilitation. Persons with a criminal record–estimated at one in four adults–urgently need access to stable jobs that pay more than the minimum wage. This is particularly the case for justice-involved women, many of whom are the primary caregiver for dependent children. These women seek employment as a CNA so that they can get off public assistance and provide food, housing and other necessities for their family. CNA opportunities are expected to increase by more than 22-percent from 2010-2020. To ban individuals from this growing industry of living-wage jobs on the sole basis of a past conviction not only denies opportunities to rehabilitated individuals; it denies many families a real chance to climb out of poverty. California’s commitment to reducing recidivism–which remains high at 63.5%–must include measures that increase opportunities to growing industries of living-wage jobs. SB 1384 would pave the way for such reform, while also ensuring that public safety remains paramount. The bill has been assigned to the Senate Health Committee. We encourage you and your organizations to write letters of support no later than Tuesday, April 16. *** The proposed bill language can be accessed here: http://www.leginfo.ca.gov/cgi-bin/postquery?bill_number=sb_1384&sess=CUR&house=B&author=mitchell_<mitchell>. For more information or questions about SB 1384 and to request a sample letter of support, you can direct questions to Natalie Lyons at Equal Rights Advocates at nlyons@equalrights.org or (415) 575-2394. Help people get back to work!